Yes, we realize it's not easy to resist a Baskin Robbins Chocolate Oreo Shake. Especially when it's oh so good. But we just thought you should know that it was rated, according to a recent article in Men's Health, as the worst food in America of 2009. 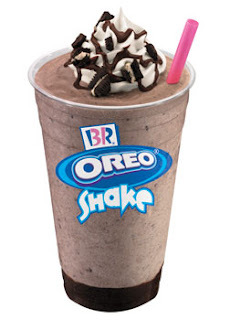 A large Baskin Robbins Large Chocolate Oreo Shake contains a whopping 2,600 calories, 135g of saturated fat, 263g of sugar and 1,700mg of sodium. Also making the list assuming you haven't already wised up and got yourself on NIM's healthy diet delivery is Outback Steakhouse's Baby Back Ribs (2,260 calories), Dairy Queen's 6-Piece Chicken Strip Basket and Chili's Smokehouse Bacon Triple-the-Cheese BigMouth Burger (which we're fairly confident clogs our arteries just by reading out loud). I am so happy that I have never tried a B&R milkshake or I would be in serious trouble.